For a while, a resident of Deer Run had noticed a horse standing in a pasture backing up to Lion Country Safari Road. Driving in and out each day, the horse seemed to always be there, just standing alone, and growing progressively thinner. Surely someone else had noticed and notified someone or done something to help? Yet, nothing seemed to change, and now Hurricane Irma was imminent. Unable to bear the thought of a starving horse trying to make it through the storm alone, the resident asked neighbors for advice, then finally approached the horse’s owners. After talking with them, they agreed to surrender the horse. Deer Run is a horse community in western Palm Beach County, and many others had also noticed the skinny horse and were willing to help. A group of concerned residents sprang into action. Someone offered to trailer the horse. The timing was a challenge. A temporary home was found for the horse, to keep him safe during the hurricane. Afterward, a more permanent home was needed. Debbie is Debbie McBride, another Deer Run resident. She, too, had noticed the skeletal horse. When she was contacted, she didn’t hesitate. “Bring him over,” she said, and somehow found room for him despite owning five other horses, not to mention goats, chickens and a pig. The horse arrived and was signed over to her a day or two after the storm had passed. Happily, Champ’s teeth were fine, and since he was tattooed — racing Thoroughbreds are tattooed on the inside of their top lips — they discovered he was 11 years old. Next, Debbie called veterinarian Dr. Bill Yerkes. Yerkes estimated Champ was a 2 on the Henneke horse body condition scoring system, a numerical scale used to evaluate the amount of fat on a horse’s body. This standardized system, used by law enforcement agencies to score a horse’s body condition in cruelty cases, ranges from 1, extremely emaciated, to 9, extremely fat. It turned into a real community effort. “Someone posted a GoFundMe page, and a lot of people helped with donations of food and supplies,” Debbie said. 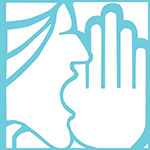 “The Red Barn feed store set up an account where people could buy supplies for us. Champ’s prognosis is good. All he needs is time and groceries. He’s still pretty ribby, but he’s gaining weight steadily. He’s a really sweet horse. 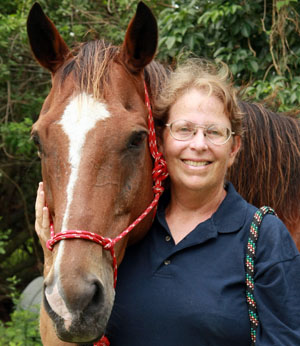 Debbie has years of experience in horse rescues. “I don’t know how many rescues I’ve done over the past 17 years. Between the Premarin foals and mares, and feedlot babies, I’d say 60 to 100. I thought I was done with rescues, but Champ needed a home. The starved ones are always the most grateful,” she said. Claudia is proud of the way the community came together for Champ.